Washington Manor is a stunning Americana bedroom collection inspired by the kind of traditional design that is found in our nation's capitol. 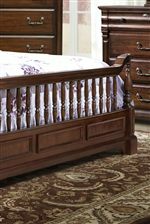 At the centerpiece of the bedroom set lies a beautiful bannister bed decked out in elegant turned posts and smooth shaping. A gently arching headboard exudes relaxed sophistication. 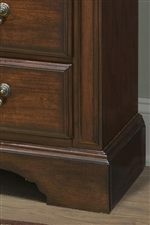 Coordinating case pieces feature understated moulding detail, shaped bases, and authentic metal knob and bail hardware. The dramatic arch of the dresser mirror echoes the arch of the bannister bed headboard, creating a pleasing sense of symmetry and completeness. 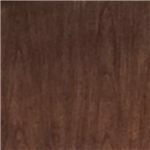 All pieces are finished in a warm, welcoming cherry. 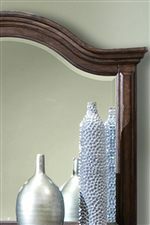 Browse other items in the Washington Manor collection from AHFA in the area.